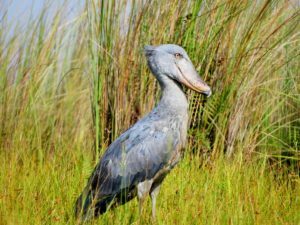 For many years I have wanted to see a shoebill so when the club arranged the annual international tour to Uganda I signed up immediately. After a fairly long flight from Cape Town to Entebbe via Addis Ababa we arrived at 3.30 in the morning and booked into the hotel situated near a botanical garden and the northern shore of Lake Victoria. Day break meant the opportunity to go out and discover new birds and so a few of us walked the short distance to the garden and spent a few hours before we had to be back at the hotel to meet our tour leader, Herbert of Bird Uganda Safaris. After spending the afternoon birding in the garden it was time for a sumptious dinner at the Protea Hotel (not the place that we were staying). The following day the bus that we were to use for the duration of the trip was loaded up with all the luggage and we set off for Mabamba, a World Heritage Site, where we were to hopefully find a Shoebill. The landing/loading area is a fairly wide channel bound by thick papyrus and the local folk use it to get to the other side of the lake. There we met up with the guides and boatmen. Each boat took a maximum of 4 tourists, a guide and the boatman and driven by an outboard motor. One would have thought that the noise of the engines would have detracted from the experience of being in a beautiful wilderness but the engines were cut when necessary and poles were used to maneuver through the channels. After a very short time the call came from the lead guide – “Shoebill” and he pointed to a spot in the far distance. Binoculars went up and sure enough there stood the bird half hidden in the grass. At first I thought that that would be the closest view but we were soon silently and carefully approaching the bird until we were within a few feet. It just stood and looked at us then continued preening as though we were just a part of the scenery. It even hunted a frog or some such morsel After about half an hour it stalked closer to us, preened a bit more and then took off, flying over our heads as if to say “There you are, you have had enough”. After that wonderful experience we spent an hour or two wandering around the waterways looking for Carruther’s Cisticola, Lesser Jacana and Papyrus Canary all of which eluded us. We did see a Rufous Bellied Heron, African Marsh Harrier, Cape Wagtail, Blue Swallow, Long-toed Lapwing, Saddle-billed Stork, Blue breasted Bee-eater and another Shoebill flying along in the distance. The full report of the Uganda trip can be read in the latest edition (No. 309) of Promerops – the magazine of the Cape Bird Club.